BACKGROUND Chronic cough is associated with an increased sensitivity to inhaled capsaicin in a number of conditions but there are no data for patients with more severe asthma or chronic obstructive pulmonary disease (COPD). Moreover, the relationships between the capsaicin response (expressed as the concentration of capsaicin provoking five coughs, C5), self-reported cough, and routine medication is not known. METHODS The cough response to capsaicin in 53 subjects with asthma, 56 subjects with COPD, and 96 healthy individuals was recorded and compared with a number of subjective measures of self-reported cough, measures of airway obstruction, and prescribed medication. In asthmatic subjects the relationships between the cough response to capsaicin and mean daily peak flow variability and non-specific bronchial hyperresponsiveness to histamine were also examined. 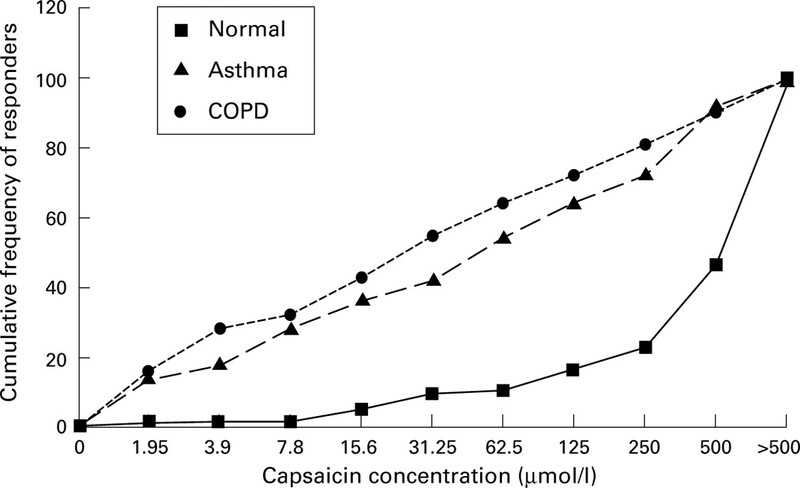 RESULTS Subjects with asthma (median C5 = 62 mM) and COPD (median C5 = 31 mM) were similarly sensitive to capsaicin and both were more reactive than normal subjects (median C5 >500 mM). Capsaicin sensitivity was related to symptomatic cough as measured by the diary card score in both asthma and COPD (r = –0.38 andr = –0.44, respectively), but only in asthma and not COPD when measured using a visual analogue score (r = –0.32 and r= –0.05, respectively). Capsaicin sensitivity was independent of the degree of airway obstruction and in asthmatics was not related to PEF variability or PC20 for histamine. The response to capsaicin was not related to treatment with inhaled corticosteroids but was increased in those using anticholinergic agents in both conditions. CONCLUSIONS These data suggest that an increased cough reflex, as measured by capsaicin responsiveness, is an important contributor to the presence of cough in asthma and COPD, rather than cough being simply secondary to excessive airway secretions. The lack of any relationship between capsaicin responsiveness and airflow limitation as measured by the FEV1 suggests that the mechanisms producing cough are likely to be different from those causing airways obstruction, at least in patients with COPD. These differences could reflect the use of different tussive agents, differing patterns of symptoms, or differences in disease severity. Unfortunately, there are few specific data on spirometry or other symptoms available from the original capsaicin study which examined only 11 patients with COPD.7 We hypothesised that the presence of chronic airflow limitation, whether due to asthma or COPD, would be associated with an increased capsaicin cough response, that the cough response would be related to the degree of airflow obstruction, and that the sensitivity to capsaicin would be altered by changing airway calibre. Moreover, we anticipated that there would a relationship between the capsaicin cough threshold and the perceived severity of the cough. In the absence of an agreed symptomatic measure of cough severity, we have compared several methods of assessing cough as a symptom to the capsaicin response measured in groups of stable chronic asthmatic and COPD patients and have compared the objective data with our previously determined normal range of capsaicin responsiveness. We recruited 53 patients with chronic asthma and 56 with COPD from our outpatient clinics. All the asthmatic patients met the conventional diagnostic criteria,9 as did those with COPD10 (table 1). The presence of a persistent cough was not necessary for inclusion in the study. All patients were clinically stable and any patient with a history of respiratory tract infection in the preceding four weeks, symptoms or investigations suggestive of oesophageal reflux, subjects taking angiotensin converting enzyme inhibitors, or those less than 18 years of age were excluded, although there was no upper age limit. No patient had clinical or radiographic features suggestive of co-existing bronchiectasis. We excluded patients with a history of allergic rhinitis, post nasal drip, and those being treated for nasal symptoms. The data were compared with those derived from our normal subject population recruited from hospital staff, free from respiratory disease, who denied cough and were not receiving any medication. All subjects gave written informed consent to the study which was approved by our institutional ethical committee. Subjects omitted short acting inhaled β agonists and anticholinergic agents for six hours before attendance and longer acting drugs such as oral theophylline or inhaled long acting β agonists for 12 hours on all test days. All subjects underwent the following tests. Capsaicin (Sigma Chemical Co, St Louis, Missouri, USA) was dissolved in absolute ethanol to make a stock solution of 10–2 M which was further diluted with 0.9% saline to produce nine doubling concentrations from 2 to 500 μM. Doses were administered from an Acorn nebuliser powered from a dosimeter calibrated to deliver 0.009 ml in each inhalation at a maximum flow rate of 0.75 l/s and a mass median particle diameter of 5.2 μm. Subjects were asked to take a single slow inhalation from the dosimeter beginning with saline control and then, with a minimum of 30 second intervals, increasing strengths of capsaicin until a given inhalation caused five coughs (C5). This dose was repeated to ensure that a reproducible C5 response had been attained and, if so, that the value was recorded as the patient's value (C5 capsaicin). (1) Diary cards: these were completed at home over a two week period during which the subject recorded symptom scores or daily cough on a five point scale ranging from 1 = no cough to 5 = distressing cough most of the day. The score over the 14 day recording period was used to calculate the mean daily diary cough score. Peak expiratory flow (PEF) was self-recorded using a mini Wright peak flow meter four times a day in a standard fashion, the best of three measurements being taken. Peak flow variation for any particular day was taken as the difference between the highest and lowest peak flow divided by the highest measure. For patients with more than nine days of complete data the mean daily PEF variability was calculated. (c) using a 10 cm visual analogue scale (VAS) marked between no cough at one end and worst imaginable cough at the other end. After the above, patients with asthma and COPD were invited to perform further tests including lung volume measurement, histamine challenge tests, and the effect of bronchodilators on the C5 response. Histamine challenge tests were performed later the same day while lung volume estimation and effect of bronchodilators were measured on separate study days during the following three weeks. In those with asthma the subgroup studied depended solely on the patient's willingness to undergo these investigations. In those with COPD some patients were unable to take a further part as they were about to enrol in another clinical trial, and others were only willing to some of the extra tests. There was no difference in mean age, percentage predicted FEV1, or median C5 response between the subgroups who underwent additional tests and their parent cohorts. (1) Static lung volumes and flow-volume loops: 38 patients with asthma and 20 with COPD performed flow-volume loops and measurement of static lung volumes while seated using a rolling seal spirometer (PK Morgan Ltd) with standard criteria for an acceptable loop.11After coaching, each subject performed repeated loops until three technically satisfactory traces were obtained. The loop with the largest sum of FEV1 and FVC was chosen and from this loop PEF, 25–75% forced expiratory flow (FEF25–75), and peak inspiratory flow (PIF) were derived. Static lung volumes were measured using the helium dilution technique. (2) Histamine challenge: 43 asthmatic patients performed histamine challenge testing 15 minutes after the capsaicin study, inhaling from a dosimeter in a standard fashion. The FEV1 was recorded before the histamine challenge to ensure that there was no change from the pre-capsaicin baseline. The concentration of histamine provoking a fall in FEV1 of 20% or more (PC20) was calculated by linear interpolation from the logarithmic concentration response curve. (3) Effect of changing airway calibre on the C5 response: 40 patients with asthma and 13 with COPD performed a capsaicin challenge test and spirometric measurements both before and 30 minutes after each 5 mg nebulised salbutamol, 500 μg nebulised ipratropium bromide, and 3 ml 0.9% saline. All solutions were given using a System 22 Acorn nebuliser on separate days at the same time of the day in random double blind order. For each disease group and for each solution the C5 and FEV1 values before and after administration of the nebulised agents were compared. Twenty three asthmatics performed a capsaicin challenge both before and immediately after the histamine challenge so that, at the time of the second histamine challenge, their FEV1 was reduced by at least 20% from baseline. 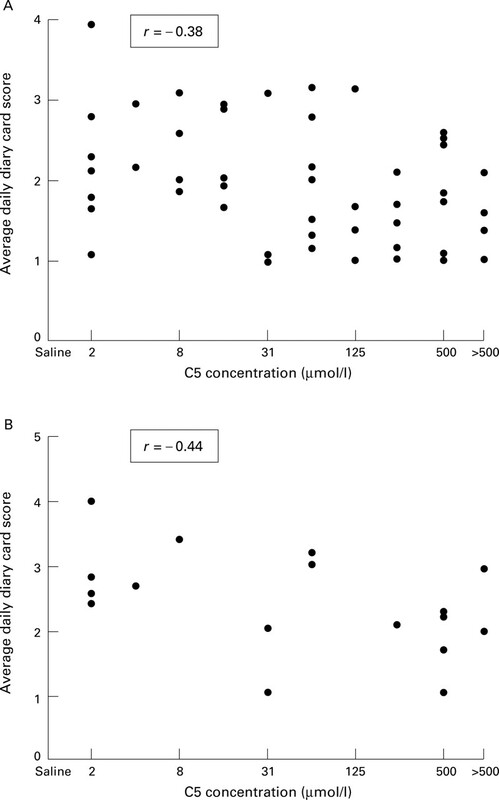 The effects of bronchoconstriction were then studied by comparing the difference between the C5 before and after the histamine challenge test with the difference between each subject's C5 response before and after saline. Median C5 values and the frequency distribution were used to describe the normal range in each disease group. These were then compared using the Kruskal Wallis test followed, if significant, by paired Mann-Whitney U tests between the groups. The relationship between symptoms and sensitivity to capsaicin was examined in a number of ways. The average daily diary card cough score and the visual analogue score derived from the questionnaire were each related to the C5 of each subject using Spearman rank correlation coefficient within each disease group. Patients were grouped into those who did and those did not cough on most days and were then compared using Mann-Whitney U tests. Subjects were also divided into those who considered their cough to be mild, moderate, or severe and these groups were compared using the Kruskal Wallis test. Similarly, subjects with asthma and COPD were subdivided into those who rarely produced phlegm, those who occasionally produced phlegm, and those who usually produced phlegm and these groups were again compared using the Kruskal Wallis test. Lung function data are presented as mean (SE). The relationship between capsaicin sensitivity and PC20 for histamine was examined using Spearman rank correlation coefficient as was that for the C5 response and lung function. Both pre and post nebuliser C5 and FEV1 values as well as pre and post histamine C5 and FEV1 values were compared using Mann-Whitney U tests. The clinical and physiological data at study entry are given in table 1. The patients with asthma were older than the normal subjects but younger than the patients with COPD (p<0.001) and almost 60% had been or were cigarette smokers. The median C5 was reduced in both asthma (62.5 μM) and COPD (31.2 μM) compared with the healthy controls (>500 μM, p<0.001, fig 1). There were no significant differences in the median or in the distribution of the C5 responses between the asthmatic and COPD patients. 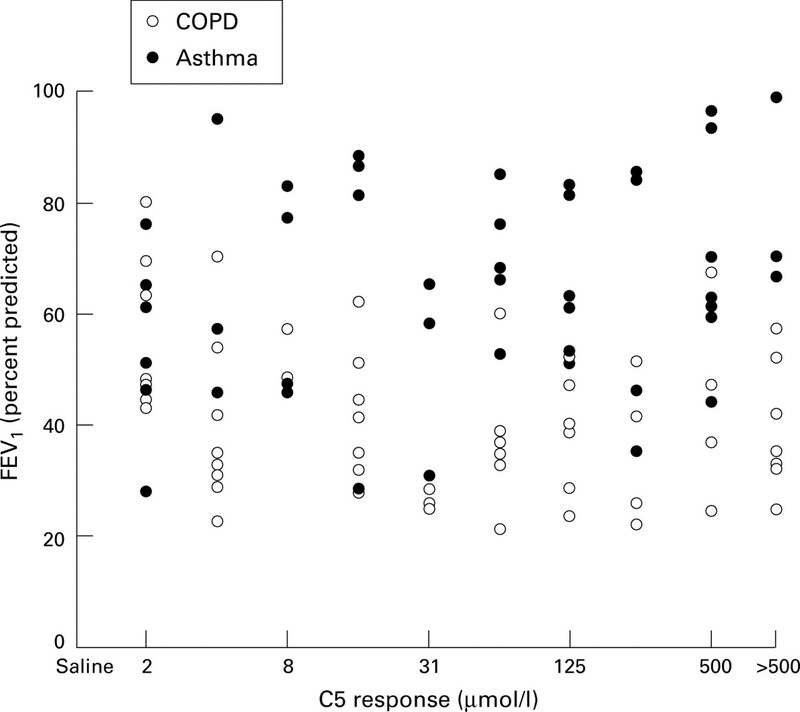 Comparison of the cumulative frequency at which subjects reached the C5 response for asthma and for subjects with COPD compared with normal subjects. Diary card data for the 53 patients with asthma showed a mean (SE) daily cough score of 1.96 (0.1) which was inversely correlated with the C5 concentration (r = –0.38, p<0.05; fig2A). Hospital questionnaire data using the VAS assessment of cough were correlated with the mean diary cough score in the 43 patients for whom both were available (r = 0.40, p<0.05). The VAS scores were more variable than the diary card scores, ranging from 0 to 8.5 cm, but they showed a similar weak correlation with the C5 values (r = –0.32, p<0.05). Scatter plots with Spearman correlation coefficients showing the relationship between self-reported cough measured using the daily diary card cough scores and capsaicin responsiveness (C5) for (A) asthma and (B) COPD. The distribution of the responses to specific questions about the perception of cough are given in table 2. The presence of any cough, of a productive cough, and the patient's assessment of cough severity were all related to an increased cough response and to a lower percentage predicted FEV1. However, overall there was no significant correlation between either the absolute FEV1 or the percentage predicted FEV1 and the measured C5 response (fig 3). The cough response was not related to whether or not subjects were current smokers or to the dose of inhaled corticosteroids taken. However, those patients using an inhaled anticholinergic drug did have a greater C5 sensitivity (p = 0.002; fig 3A). The C5 response of those patients not treated in this way was still significantly greater than that of the normal subjects. Comparison of the cumulative frequency at which subjects reached the C5 response by medication for both asthma and for COPD: (A) asthma: inhaled anticholinergics versus no inhaled anticholinergics; (B) asthma: low versus moderate versus high dose inhaled corticosteroids; (C) COPD: inhaled anticholinergics versus no inhaled anticholinergics; (D) COPD: inhaled corticosteroids versus no inhaled corticosteroids. Complete symptomatic data were available in only 19 cases, the remaining patients having been recruited into a study of inhaled corticosteroids where treatment changes might have affected the data. These patient groups did not differ significantly in their smoking habit, percentage predicted FEV1, or median C5. They reported a higher daily cough score than the asthmatic subjects (2.36 (0.18) versus 1.96 (0.1)) but this difference was not significant. As for asthma, there was a correlation between the cough score and the mean C5 response (r = –0.44, p<0.05; fig2B). Data on the response of COPD patients to the cough questionnaire are given in table 2. Apart from a non-significant trend for the patients with ‘severe’ cough to have an increased sensitivity to capsaicin (p = 0.1), there were no associations between the presence or absence of symptoms and either C5 or FEV1 (fig 4). Similarly, there was no association between the recorded C5 and current smoking status or the use of inhaled corticosteroids. However, those patients using inhaled anticholinergic treatment had an increased C5 response compared with those not so treated (p<0.03; fig 3C), the remaining subjects still having a greater C5 response than the healthy controls. C5 values were independent of all the parameters derived from the flow-volume loop and of the static lung volumes. In patients with asthma C5 was unrelated to the diurnal PEF variability or to the baseline PC20 histamine. In the 40 patients tested before and after bronchodilators a mean increase in FEV1 of 0.37 (0.04) l after salbutamol or 0.36 (0.04) l after ipratropium from a baseline of 2.07 (0.13) l did not change the median C5 response. Similarly, the median C5 values were unchanged in the 23 asthmatic patients measured before and after histamine challenge, despite a fall in FEV1 of a mean of 0.6 (0.05) l from a baseline value of 2.1(0.12) l.
In the 13 patients with COPD tested before and after bronchodilators the FEV1 rose from 1.2 (0.12) l to 1.37 (0.13) l after salbutamol and to 1.41 (0.14) l after ipratropium, but without a significant effect on the measured C5 response. The reduced C5 in patients with chronic stable asthma was not surprising in view of the earlier reports in milder disease. A range of possible mechanisms involving different inflammatory mediators has been suggested to explain the enhanced C5 response.13 19 20However, given the heterogeneity of FEV1 and PC20 of the asthmatic populations in which this has now been reported, it seems likely that increased cough susceptibility is either produced by very non-specific means or involves an entirely different pharmacological pathway from the mechanisms which determine the severity of airways reactivity or resting airway calibre. This has implications for the modification of cough as a symptom in asthma. Studies in patients with chronic bronchitis or COPD where lung function data are available have examined less severe disease and/or a population diagnosed as having chronic sinus disease,22neither being representative of unselected COPD patients reported here. Our patients met the conventional diagnostic criteria for COPD, had limited bronchodilator reversibility and a history of past or current smoking, making it unlikely that there was a significant asthmatic element to their illness. In these patients we found no association between reported sputum production and either cough severity or C5 threshold. 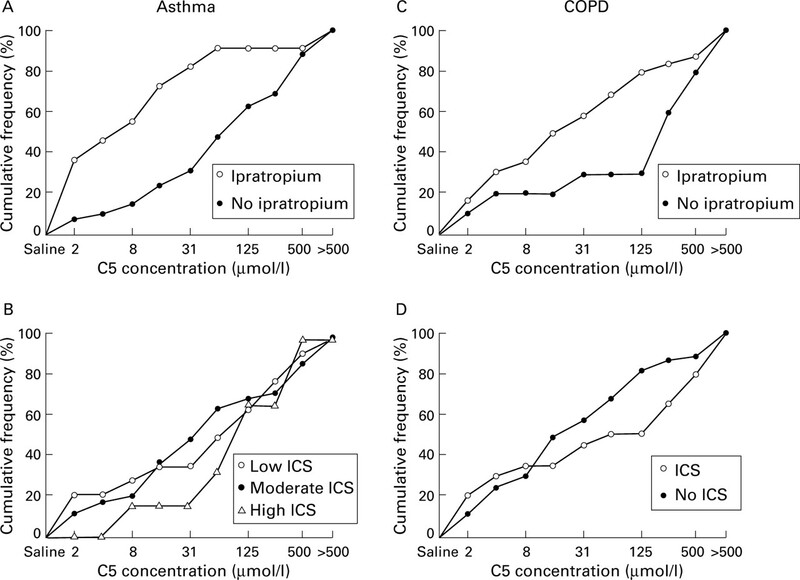 Induced sputum studies have shown levels of pro-inflammatory cytokines in both asthma and COPD.23 24 Persistent airway inflammation may contribute to the enhanced C5 response and merits further investigation. The confounding effects of drug treatment or smoking are unlikely to explain our findings. Regular use of β agonists does not appear to modify the C5 response, despite earlier reports of benefit in cough induced in volunteers,25 and our patients were asked to omit inhaled therapy before attendance. Short term use of oral corticosteroids and longer term use of inhaled corticosteroids are associated with changes in the frequency of symptomatic cough in COPD.26 Specific data about the effect of these drugs on cough threshold are lacking. We found no relationship between smoking status and C5, neither did the regular use of β agonists or inhaled corticosteroids relate to the recorded response. Likewise, there were no differences in the symptom severity of cough, however assessed, and the presence of sputum production or use of inhaled corticosteroids. We found that the C5 cough threshold was significantly lower in both asthmatic and COPD patients taking regular inhaled ipratropium, although the patients not using these drugs were still more responsive than the control subjects. Whilst it is tempting to postulate that this may be a pharmacological effect, it is more likely to reflect selection of the more severe patients among the asthmatic group9 and the widespread use of these drugs among COPD patients.10Indeed, anticholinergic agents have been shown to decrease rather than increase the nasal response to capsaicin.27 Prospective studies of the capsaicin response before and after the introduction of anticholinergic treatment would be needed entirely to exclude this as an adverse reaction to treatment. Whilst differences in the deposition of capsaicin to more central airway receptors might be hypothesised to explain some of the apparent similarities in asthmatic and COPD patients, the absence of any relationship between C5 and the severity of airflow limitation is a pointer against this. None of the measures of airflow limitation were related to C5 in either disease. Moreover, the C5 was unaltered even when the airway calibre was varied acutely, suggesting that neither airflow limitation alone nor changes in capsaicin deposition explain the increased level of response in our patients with asthma or COPD. A similar lack of effect of smaller changes in airway calibre has been reported in normal subjects,25 but our data confirm that this is true in established disease when baseline FEV1 is reduced. C5 was not related to the level of bronchial hyperreactivity or to the level of PEF variability over two weeks, providing further evidence that the mechanisms underlying cough production are not necessarily related to those determining airway calibre. Our data show that a reduced cough threshold is a frequent finding in airways disease, whether associated with asthma or COPD. Reliance on one measure of self-reported coughing can be difficult to interpret, particularly in COPD. Use of the capsaicin challenge gives objective information about cough susceptibility which may prove more discriminatory than just questioning about the presence or absence of cough or sputum production. The relative role of this mechanism and its relationship to the effects of other agents such as citric acid or low Cl– as the disease progresses merits further study. The mechanisms producing increased capsaicin responsiveness, whether inflammatory or mediator driven, also require further exploration, particularly in patients with COPD where an abnormal cough threshold appears to be relatively common. (1981) Chronic persistent cough in the adult: the spectrum and frequency of causes and successful outcome of specific therapy. Am Rev Respir Dis 123:413–417, . (1979) Chronic cough as the sole presenting manifestation of bronchial asthma. N Engl J Med 300:633–637, . (1965) Chronic obstructive lung disease. II. Relationship of clinical and physiological findings to the severity of airway obstruction. Am Rev Respir Dis 91:665–678, . (1959) CIBA Guest Symposium Report. Terminology, definitions and classification of chronic pulmonary emphysema and related conditions. Thorax 14:286–299, . (1995) Clinical and laboratory assessment. in Chronic obstructive pulmonary disease. eds Calverley PMA, Pride NB (Chapman and Hall, London), pp 309–349, . (1967) Role of autonomic nervous system and the cough reflex in the increased responsiveness of airways in patients with obstructive airway disease. J Clin Invest 46:1812–1818, . (1997) The British guidelines on asthma management: 1995 review and position statement. Thorax 52 (Suppl 1) S1–21, . et al. (1997) BTS guidelines for the management of chronic obstructive pulmonary disease. Thorax 52 (Suppl 5) S1–28, . (1993) Lung volumes and forced ventilatory flows. Report of the Working Party on Standardization of Lung Function Tests, European Community for Steel and Coal. Official Statement of the European Respiratory Society. Eur Respir J Suppl 16:5–40, . (1994) Capsaicin cough sensitivity decreases with successful treatment of chronic cough. Am J Respir Crit Care Med 150:374–380, . (1989) Sensitivity of the human cough reflex: effect of inflammatory mediators prostaglandin E2, bradykinin, and histamine. Am Rev Respir Dis 140:137–141, . (1995) Prostanoids and cough response to capsaicin in asthma and chronic bronchitis. Eur Respir J 8:1499–1505, . (1998) Relationship between airway obstruction and respiratory symptoms in adult asthmatics. Chest 113:272–277, . (1994) Cough receptor sensitivity and bronchial responsiveness in patients with only chronic nonproductive cough: in view of effect of bronchodilator therapy. J Asthma 31:463–472, . (1991) Effect of changes in inspiratory flow rate on cough responses to inhaled capsaicin. Clin Sci 81:539–542, . (1995) Abnormal intraepithelial airway nerves in persistent unexplained cough? Am J Respir Crit Care Med 152:2068–2075, . (1989) Capsaicin and nicotine-sensitive afferent neurones and nasal secretion in healthy human volunteers and in patients with vasomotor rhinitis. Br J Pharmacol 96:693–701, . (1993) Effect of inhaled procaterol on cough receptor sensitivity to capsaicin in patients with asthma or chronic bronchitis and in normal subjects. Thorax 48:615–618, . (1997) Granulocyte activation markers in induced sputum: comparison between chronic obstructive pulmonary disease, asthma, and normal subjects. Am J Respir Crit Care Med 155:449–453, . (1996) Differences in interleukin-8 and tumor necrosis factor-alpha in induced sputum from patients with chronic obstructive pulmonary disease or asthma. Am J Respir Crit Care Med 153:530–534, . (1990) Prostaglandin F2 alpha enhancement of capsaicin induced cough in man: modulation by beta 2 adrenergic and anticholinergic drugs. Thorax 45:694–698, . (1990) Assessment of reversibility of airway obstruction in patients with chronic obstructive airways disease. Thorax 45:190–194, . (1998) Cough receptor sensitivity to capsaicin and tartaric acid in patients with Mycoplasma pneumonia. Lung 176:281–288, . (1995) Resolution of ACE inhibitor cough: changes in subjective cough and responses to inhaled capsaicin, intradermal bradykinin and substance-P. Br J Clin Pharmacol 40:423–429, .